I seem to have 8 or 9 beers in front of me, and they are all from the same brewery. If I was in Greenwich Village, New York, that wouldn’t be too unusual. But I am in Greenwich, London, and it’s a little more unusual to find 9 beers from one brewery here. These beers are all from the Greenwich Meantime Brewery. 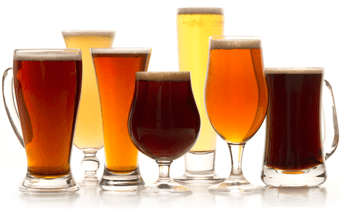 It’s a wonderful range of styles: lager, pilsner, Vienna, raspberry hefeweizen, coffee beer. They are diverse and not at all as conservative as those made at many English breweries. In fact, this brewery works with three different yeasts and 20 or so different malts and hop varieties. Their business is far more parallel to a winery, which is part of the revolution that is much more evident in the U.S. than in the U.K.. But Meantime is taking the right direction. The brewery is called Meantime because, being based in Greenwich, it lies just near the zero meridian. This is when time began, perhaps, and it is also a very historical shipping and naval village. It’s a very good place for a brewery to exist, especially the first microbrewery in Britain to specialize in such a variety of both lager and ale styles. It’s a hard slog to help the customer exercise some individuality, but founder and brewmaster Alastair Hook has done an extraordinary job of providing innovative beers. And I don’t think that beer drinkers are as conservative as the big brewers would want us to believe. The Old Smoked Bock is a rauchbier. The word “rauch” is German for “smoke”, and is a style of beer particularly associated with the town of Bamberg, in the region of Franconia in the north of Bavaria. But this one is made in Greenwich, London, with imported smoked malt from Germany. The word “bock”, of course, means strong beer, for the winter or early spring when it is still a bit cold. A strong, warming beer in the German tradition. This actually has the alcohol content of a double bock, it’s 6.5% by volume. You wouldn’t believe that when drinking it. It’s so smooth and slips down so easily that it is a very dangerous beer. About as dangerous as the billy goats that are often shown on bock labels. The important point about this beer is that it is a smoked beer. Part of the process of turning barley into malt, in order to be able to brew with it, is drying. In these days most barley is dried over warm air, but before they learned how to do that most brewers dried their malt over a fire. In parts of Germany and central Europe, the fire was a wood fire. Wood was a readily available fuel, and in the Bamberg area it was typically a beech wood fire. It’s very much the same idea as drying barley over a peat fire in Scotland. If you like a smoky Scotch whisky, you’ll certainly like a smoked beer. If you don’t like a smoky Scotch whisky, try a smoked beer anyway. They say in Bamberg that it takes about 7 liters to really get the hang of it. I loved it from the first mouthful. Some people find the smokiness a bit challenging, but the smokiness of this one is not aggressive. 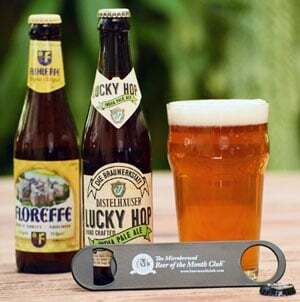 And because it is a strong beer, there are the peppery alcohol flavors, and big rich malty flavors. It’s a wonderful combination, and is a bit of a style of its own. A smoked bock beer made in England. It’s the first time that I have encountered those three elements in one beer. I have traditionally suggested that these beers go well with smoked Bavarian hams, or smoked sausage. Smoked cheeses work nicely, too. It does make a very good accompaniment to smoked foods. As a beer in its own right, it is remarkable in terms of its style and its devilish drinkability combined with wonderfully satisfying flavors. So in German style, prosit. Made in England, cheers. There is some debate as to the origins and meaning of the term Bock as a descriptor of beer. Many reference books state that it derives from the German town of Einbeck, which was noted for strong ales. Many German brewers, however, are sceptical. In Germany Bock means brewed at a certain original gravity (16°Plato) and Doppelbock, means brewed stronger still. Elsewhere, Belgium for instance, it just means strong. Consequently ‘Bock’ is not really a beer style. You can have wheat bocks, dark bocks, old bocks, light bocks and smoke bocks. Meantime Old Smoked Bock is made with a blend of Munich and smoked malts, plus generous quantities of classic German hops varieties - Perle and Spalter. If ‘chewy’ makes any sense when describing a beer then Old Smoked Bock is definitely a chewy beer, with a savouriness that reminds you that these old style beers were, for most people, food as well as drink. This is a beer to go with hearty warm winter food; casseroles, heavily sauced meats, or strong cheese with tangy pickle and brown bread.